1 The war in Iraq, also called "Operation Iraqi Freedom," began in March 2003. 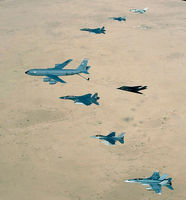 The United States and its allies, mainly Great Britain, decided to attack Iraq for several reasons. They believed that the Iraqi government was making and storing weapons of mass destruction (WMD). They believed Iraq had missiles forbidden by the United Nations (UN). They believed Iraq was making nuclear weapons, too. They also believed that Iraq's government allowed terrorists to live in Iraq. President Bush thought that Iraq might give chemical weapons to terrorists. He thought Iraq or terrorists might use weapons of mass destruction against the U.S. and Britain. 2 Since becoming dictator of Iraq in 1979, Saddam Hussein had been cruel and brutal. 3 Hussein used chemical weapons against one group of Iraqi citizens, the Kurds, in 1988. Thousands of innocent people, many of them women and children, died from or were injured by chemical bombs. Saddam lived in luxury, building forty palaces for himself, while many of his people were poor and starving. 4 The U.S. and its allies attacked Iraq on March 20, 2003. Baghdad, the capital city, was captured on April 9. By May 1, President Bush declared that the war was over. However, violence in Iraq continued. 5 When allied troops entered Iraq, the Iraqi army tried to stop them. There were also military fighters who were not part of a regular army who fought allied troops. The Iraqis did not follow the rules of war. They used suicide bombers to attack troops. The army stored weapons in schools and hospitals. They knew that allied soldiers did not want to hurt people who might be in these buildings. They used innocent people as shields so the allied soldiers would not shoot back at them.